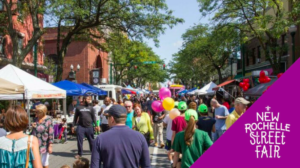 Don’t miss the annual New Rochelle Street Fair this Sunday, September 9th, from 11am to 5pm. Main Street will be closed to traffic, but filled with vendors offering tasty food and drink, crafts and artwork, music, and more. If you’d like to help out, volunteers are invited to assist in managing the event, as part of Volunteer New York’s 9/11 Serve + Remember weekend. Here’s more information about volunteer opportunities. Hope you see you on Sunday!